New Type Of Killer Whale Found Swimming In Southern Ocean The notion that there might be some new kind of killer whale emerged in 1955, when photos from New Zealand showed a bunch of unusual-looking whales stranded on a beach. 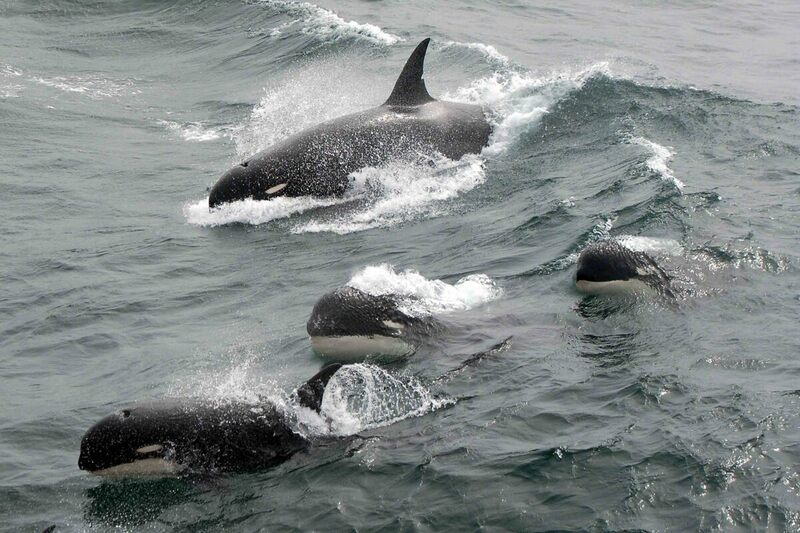 A rare photo of "type D" killer whales off South Georgia island, located between South America and Antarctica, shows the whales' blunt heads and tiny white eye patches. Scientists say they've found a mysterious type of killer whale that they've been searching for for years. It lives in parts of the ocean near Antarctica — and it could be the largest animal to have remained unidentified by biologists. The notion that there might be some unusual kind of killer whale emerged in 1955. Photos from New Zealand showed a bunch of whales stranded on a beach. "This was a very different-looking group of killer whales," says Robert Pitman, a marine ecologist with the National Oceanic and Atmospheric Administration. The whales were smaller than other killer whales, and they had rounded heads and pointier fins. "And most importantly," Pitman adds, "they had a little tiny eye patch," a white spot under each eye characteristic of killer whales. These patches were unusually small, in some cases almost nonexistent. Then in 2005, Pitman met a French biologist at a science conference who showed him a photo of an odd-looking killer whale swimming in the southern Indian Ocean. "And I looked down, and there they were, the New Zealand killer whales," he recalls. For Pitman, the hunt was on. Last year, he assembled a team to go to Cape Horn, in Chile, to look for what's now technically called the "type D" killer whale. Local fishers had been complaining that some kind of whale was stripping fish off their lines. NOAA biologist Lisa Ballance, who's married to Pitman, was part of the team. "From the beginning, I had referred to it as the needle in the haystack," she says. "It's a big ocean, and it's a rough ocean." It was a slow start. Their ship at Cape Horn was trapped at anchor for eight days by howling weather. But then they got a 12-hour quiet spell. "We left that night," Ballance recalls, and "pounded into the seas so that we could get to our spot at first light the next morning." Pitman picks up the story: "The sun came up in the morning at 5:50. We had type D killer whales swimming around our boat." "There they were," Ballance recalls, for a moment at a loss for words. "Uh ... I can't even ... it was thrilling for all of us." Pitman adds: "It's like seeing a dinosaur or something. It's one of those moments that biologists live for. And I said, 'That's it! That's the New Zealand killer whale!' "
There was no mistaking its peculiar look, says Ballance. "Visibly," she says, "this form is the most unusual and distinct form of killer whale on the planet." Later, they realized why the whales swam up to them. The team had lowered an underwater microphone over the side on a long cable, with cameras attached. Pitman says it must have looked like a fishing line with fish on it — it looked like breakfast. "And you can imagine them thinking, 'Hey, where's our fish?' " he says. "But that was definitely the way to bring them to the boat." The team was able to snip off small tissue samples from the whales by firing a harmless dart, attached to a line, into their skin. An analysis of the DNA will determine if this is actually a completely new species or just an unusual subtype. Either way, the mystery killer whales of the Southern Ocean have been found.